If you are having trouble speaking, reading, writing, or comprehending, speech therapy will likely be prescribed by your physician. The process to find and secure a speech-language pathologist (SLP), also known as a speech therapist, can be overwhelming. From the time your doctor recommends speech therapy to your first session, you may have questions. 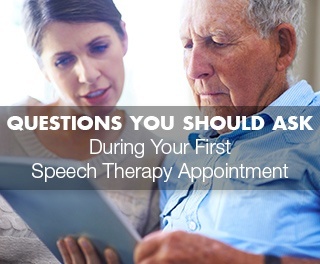 You may be wondering, “What is speech therapy for adults like?” and “What should I expect during the first session?” Below we've answered many of common questions to help you navigate your first speech therapy appointment. What should you expect at your first speech therapy visit? During your first speech therapy session, the speech-language pathologist will complete a collaborative assessment, to determine whether speech therapy treatment will be beneficial. The SLP will begin by talking with you and your loved one about your communication or swallowing concerns. She or he will review your medical history, and explain the factors that are impacting your language, voice, swallowing, and/or articulation of speech, etc. The SLP will then evaluate your current skills by using standardized and/or informal tests and clinical observations. Following the evaluation, the speech therapist will review the results of the assessment and advise you whether speech therapy is indicated. He or she will typically prepare a written report with a summary of the assessment and a speech-language diagnosis. At this time, the SLP will collaborate with you to formulate personalized goals for treatment. Are you ASHA certified and licensed by the state to practice speech therapy? After the initial evaluation, is there a waiting list for treatment? What age and specific areas are your specialties? How frequently do you recommend speech therapy for me? How long will my speech therapy sessions be each week? How will you let me know about progress in meeting my speech therapy goals? How often? What is your prognosis for the recovery of my speech and language skills? Will you provide a means for communication devices while we are working on speech and language skills? What can I do to help practice these skills at home? What will we do during a speech therapy session? Can my family member or caregiver observe and/or participate in the therapy sessions? What work and/or exercises can I do on my own? What kind of support do I need and who is the best person to provide it? If I work on one thing outside of therapy, what should it be? What can I do at home to help my progress? What apps or online therapy programs can I benefit from using? It's important to remember that speech improvement requires a lot of practice and patience. Just like you would train for a marathon every day, you need to train to improve your speech. Any additional practice you can do will help strengthen your skills. Lingraphica offers free resources to stroke survivors and caregivers including communication apps, online therapy services, as well as free communication device trials. If you have any questions about our offerings, please call us at 888-274-2742 or click below to fill out our Contact Us form.